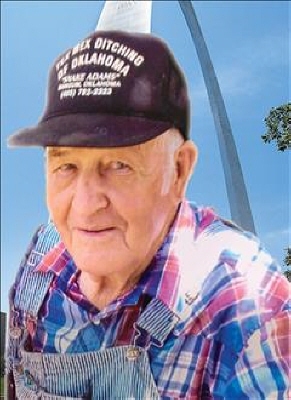 Neil Donald Morris, 90, resident of Mangum, Oklahoma passed away February 11, 2019 at Grace Living Center. Neil was born February 24, 1928 in Lincoln Nebraska to Robert and Mary Morris. His father was a traveling construction worker employed by PDM (Pittsburg-Des Moines Steel Company). During high school his father worked in helping to construct the Hollis Water Tower which is how Neil found his way to Southwest Oklahoma. Neil graduated from Hollis High School. Following in his father's footsteps he joined PDM working as a foreman helping in the construction of bridges, water towers and even the construction of the St. Louis Arch. Water towers were Neil's specialty, he helped in the construction of local water towers in Lawton, Duke, Hobart and Weatherford as well as all over the United States. He retired from the City of Mangum, after 20 years. He was a member of the Baptist faith. On June 14, 1971 he married Ruth (Gambill) Martin. He had a passion for animals and enjoyed rescuing dogs and taking care of his cows. His constant companion around the house and the farm was his dog Charlie, who held a special place in his heart. Neil is survived by his wife; Ruth Morris, son; Robert Morris, daughters; Adele Cooley and Bill, and Mary Kay and Jack Clark, Stepson; Steve and Gaylon Martin, one sister; Gail Hagin; several grandchildren and great grandchildren. He was preceded in death by his son Allen Morris, daughter; Celinda Morris, one brother and two sisters,and daughter in law, Marsha Morris. Funeral services will be 10:00 a.m. Friday, February 15, 2019 at the First Baptist Church of Mangum, Oklahoma with Pastor Casey Paxton officiating. Interment will follow at Riverside Cemetery in Mangum, Oklahoma. Funeral arrangements have been entrusted to Greer Funeral Home, Mangum, Oklahoma. To send flowers or a remembrance gift to the family of Neil Donald Morris, please visit our Tribute Store. "Email Address" would like to share the life celebration of Neil Donald Morris. Click on the "link" to go to share a favorite memory or leave a condolence message for the family.